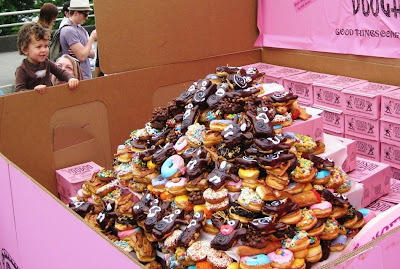 On Portland's Hawthorne Bridge, a local doughnut shop recently unveiled a box of 3,880 doughnuts, weighing 666 (eeevil!) pounds in total. It's a new world's record, doubling the previous mark of 333 pounds. But then, instead of tossing the gigantic pink box of Type II diabetes into the Williamette River, the doughnut makers started distributing the sugary confections (including their signature "Fruit Loop-crusted" doughnuts) to the crowd. You hear that, Portland? Stop being so awesome, 'cause no good deed goes unpunished.